When it comes to third party calendar applications, very few names other than Fantastical come to mind. In a few years, the app has become a staple for anyone looking to improve the way they create, edit, and view calendar events on iOS or on Mac OS X. Although I was a late adopter of Fantastical for iPhone, the app quickly became one of my essential applications. 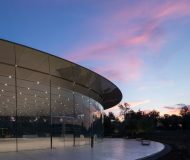 Not only it allows you to create events in a very efficient and intuitive way, but it also displays those events in a beautiful manner, greatly improving the stock experience provided by Apple. Like all apps that have been updated for iOS 7, Fantastical has received the flattening treatment. This is obvious from the time you download the new application as you will recognize the logo, which now appears to be cleaner, simpler, yet keeps its very recognizable look. 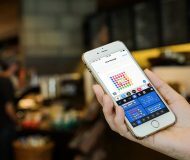 Upon launching the application, you will feel at home right away, as the app has kept its familiar look, but greatly improved it to take advantage of iOS 7 design cues. Everything is flat, elegant, and clutter free. By default, the app comes with a dark theme activated. I am not a big fan of that dark theme, and thankfully, there is a toggle to activate a light theme in the app settings. All screenshots you’ll see in this review were taken with the light theme on. While that might come as a disappointment to some users, I’m actually happy the guys behind Fantastical didn’t try to reinvent the wheel here. They took the simple design of the previous version and adapted it for iOS 7. As I always say in French, there is no reason to change a winning combination. When I first tried Fantastical for iPhone a while ago, I immediately fell in love with the design of the main view, which was very similar to the stock app while adding design elements that made it more elegant and maybe more importantly, easier to use because of all the visual improvements. Fantastical for iOS 7 is still going in the same direction. It still reminds me of the stock iOS 6 Calendar app, but again, the look and feel of it has been greatly improved. Those of you who’ve used Fantastical before will be familiar with its DayTicker view, which displays only today and the next four days. It’s a great way to see what your week looks like without taking too much screen. People like me who like to have a more global view of their calendar pull down on the DayTicker to display the monthly view. Rotate your iPhone in landscape mode to get an elegant overview of your week. One of the most annoying things in the stock iOS 7 Calendar app is that you can’t visually make the difference between what calendars you have events scheduled for unless you tap on a specific day. Because Apple chose to “simplify” how it displays days that contain a scheduled event with a single grey dot, I, for example, can’t tell if the event scheduled for next week appears on my personal calendar or my wife’s calendar to which I am subscribed. Whether you are in the DayTicker or monthly view, you will always be able to see what kind of events are ahead of you thanks to the colored dots that represent each calendar you’re using. My personal calendar is blue. My wife’s is pink. Fantastical allows me to easily see that next Tuesday, my wife has a scheduled event. It’s a simple feature, but a very useful one assuming you use several calendars. By default, when you tap on a specific day, the app displays your events for that day, as well as the following days. I like to keep things clearly separate so I went into the app settings and made sure that the events list only shows events for the selected day. It’s a personal preference, and it’s nice to have the option to have either one or the other view. Tap on a specific day to see what events are scheduled for that day. If you have Reminders scheduled for that day, you will also be able to see those reminders, edit them or mark them as completed. Again, Fantastical just gets access to your stock Reminders data (after asking you for permission of course). Marking a reminder as completed in Fantastical will automatically mark it as completed in Reminders as well. When you launch the application, all your calendars will be automatically populated in Fantastical. That means that if you have 4 calendars in your stock app, they will all automatically appear in Fantastical. Of course, you can choose which one you want to display in the app settings. It’s important to note that, like most calendar apps out there, Fantastical just accesses your stock calendars data. It doesn’t duplicate or parse it through some remote servers. If you create an event in Fantastical, this event will instantly show in your stock Calendar app, vice versa. There is no export/import necessary. There is no risk of duplicate entries or accidentally deleting events. Without a doubt, the best feature of Fantastical is its smart event input parser. Let’s say you want to schedule lunch with Jeff next Friday from 1 to 3pm. You could very well take the time to type in “Lunch with Jeff” and manually adjust the date and time. Or you can let Fantastical do the heavy lifting for you. Simply create a new event and type “Lunch with Jeff next Friday from 1 to 3pm.” The parser will automatically turn your words into actual event data. If you want to be even more productive, don’t even bother typing in, just use dictation to input the data. The parser has also seen some significant improvements in this iOS 7 update with the addition of expanded expressive repeated events creation. For example, you can type in or dictate to Fantastical “Meeting with the Bobs the third Friday of each month, alert 1 hour before.” The event will automatically repeat itself every third Friday of each month with an alert one hour before, until you delete this event. Apparently, there are many other expressions you can use with Fantastical 2, but I don’t think a full list is currently available. Making this list available would definitely be a good idea as you’d be able to know the full extend of what you can type/say in Fantastical. 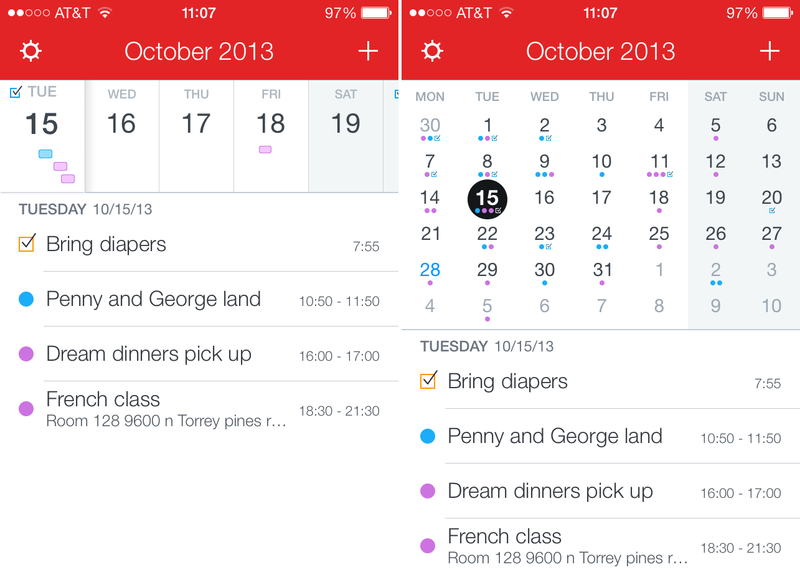 Fantastical 2 comes with more new features but I only noted those I thought were the most useful. Fantastical 2 is a new application available in the App Store for $2.99 for a limited time, after which, the app will be priced at $4.99. It means you will have to pay for the app, regardless of whether you already owned it or not. 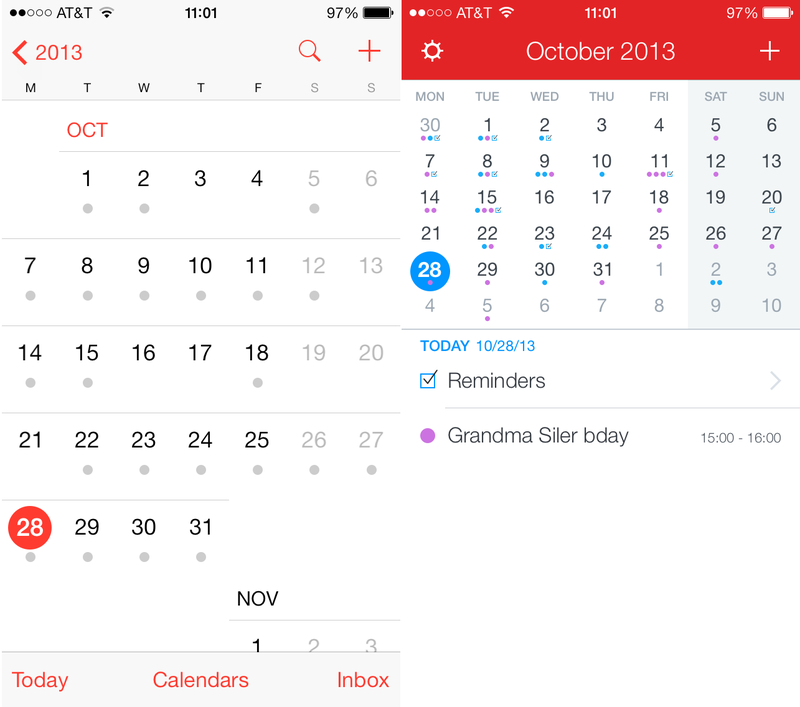 Fantastical 2 is available for iPhone and iPod touch only, although I believe an iPad version is in the pipeline. I can already sense that some people will be complaining about the separate release. 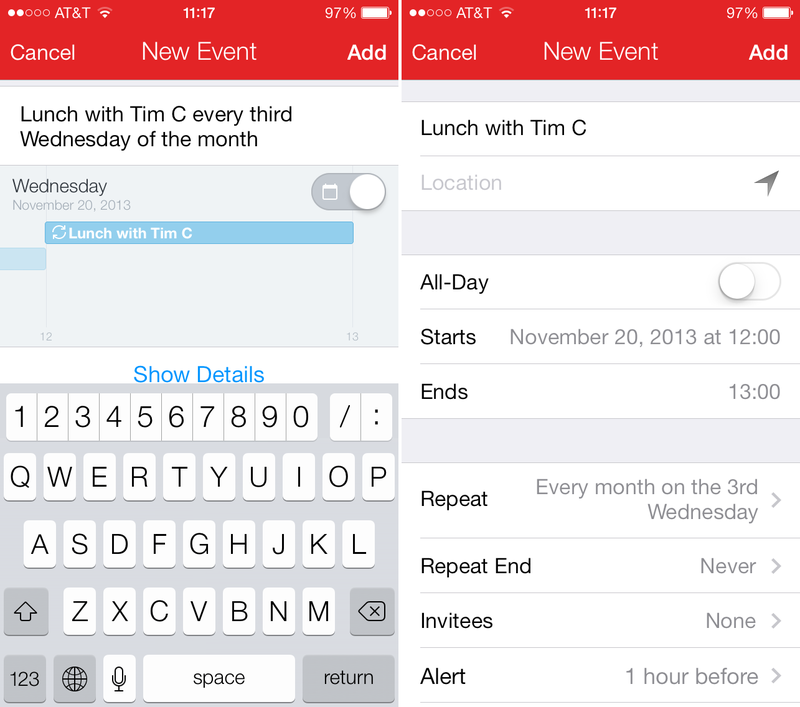 The fact is, Fantastical 2 is a new app with new features. It’s not just an app with a fresh coat of paint. It is a brand new app, with a brand new look, and brand new features. If you have a problem with that, you can keep using the previous version. 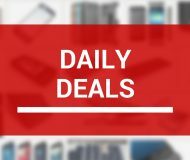 For the past few weeks, the previous version of Fantastical had been available in the App Store at the discounted price of $1.99 with a disclaimer in the app description warning potential buyers that a new version was coming up as a separate release. I really like this approach because it was very straightforward and fair to potential buyers. The developers didn’t try to trick people into buying an app that was soon to be updated as a separate release. Additionally, the previous version of Fantastical has recently been updated with iOS 7 bug fixes. That means that if you bought Fantastical before, you can still use it on iOS 7. The app will no longer be updated, but it is currently working on iOS 7. The competition in the calendar apps landscape has been heating up for a while, but to me, Fantastical is still the best out there. Its clean and elegant design as well as its features make it a no brainer for me. 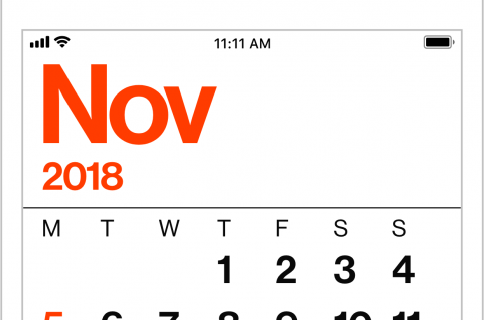 Fantastical 2 is the one and only calendar app on my iPhone and it is the one I will gladly recommend to anyone in the market for such an application. If asked about possible downsides, I can’t really think of any. If you really pushed me to tell you something negative about Fantastical 2, I’d probably complain about the default dark theme, which as mentioned above can be superseded by a light theme. I’m also not too fond of the additional row of numerical keys in the custom keyboard (as pictured above). While it’s very useful, I’m just not a big fan of its layout. That’s about all you’ll hear me complain about Fantastical 2. I’ll definitely live with that. Obviously this is not the cheaper option in the App Store, but if you don’t see the value of this app, then maybe it’s not for you, and I’m sure you will be doing just fine using cheaper or free alternatives. 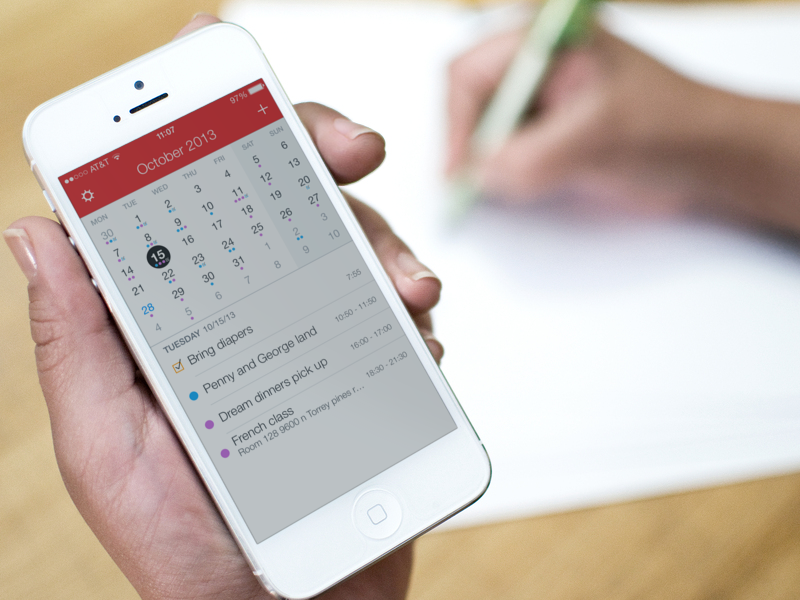 If you want an elegant and powerful calendar application, I urge you to download Fantastical 2 now.